Seven-year-old boy Sherman lives with his father, a small dog named Mr. Peabody. Sherman was adopted as an infant after Peabody found him, abandoned in a box. Peabody has worked hard to prepare Sherman for school, even using a time machine to allow Sherman to experience the past first-hand. Sherman fits in with the unpopular kids at school. 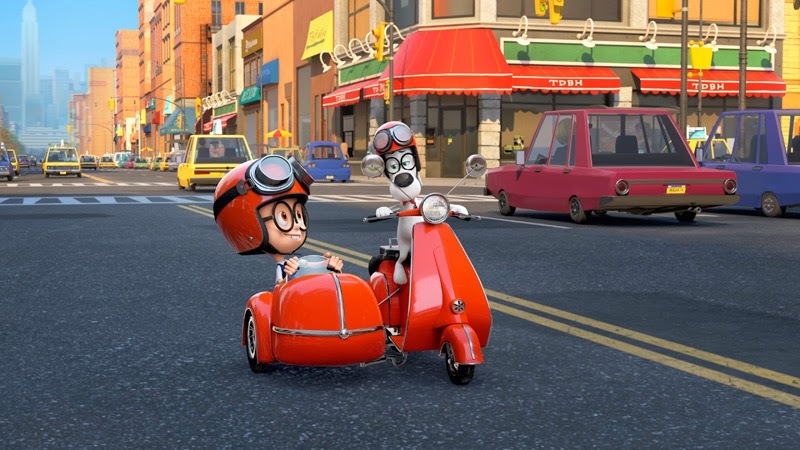 Penny, one of the popular girls, upset when Sherman corrects her in class, sets out to humiliate Sherman by calling him a dog; after all… Mr. Peabody is his father. She tries to demean Sherman in front of their classmates. When Sherman retaliates violently, a social worker responds. She expresses her intention to have Sherman removed from Mr. Peabody’s home. Peabody must figure out a way to make peace with the girl and her parents before the social worker completes her investigation. Along the way Sherman and Penny have a time-travelling adventure which brings them close to many historical figures and closer to each other. There’s lots of adoption relevance here. Peabody fought in court for the right to adopt Sherman. Peabody explains that he did this because he had never had a family, and wanted to provide one to Sherman. Adoption themes fuel the conflict and plot. 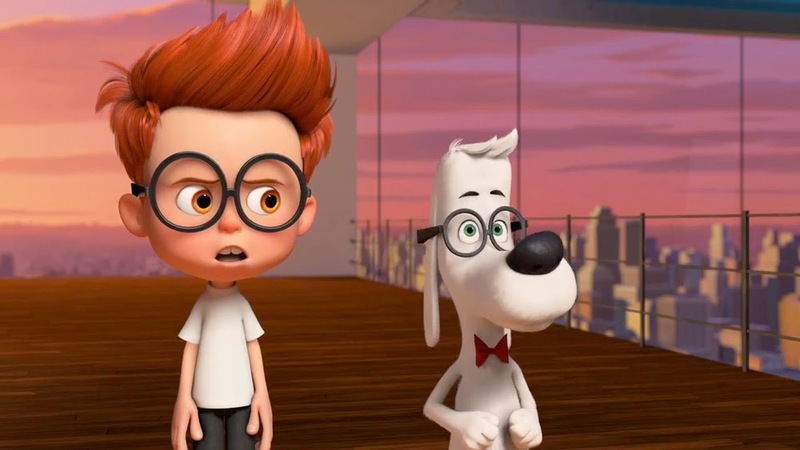 Mr. Peabody is an example of someone who ages out of a group home and manages to succeed in the world, anyway. Then, he remembers his own experiences and tries to help someone in a similar situation. Peabody is a good father in many ways. He always considers Sherman’s best interest, and promises that he will always be there for Sherman. Sherman and Peabody have a positive relationship. Although it goes through challenges, it is strengthened by the end of the film. It might be hard for some viewers to watch a scene where, as a young pup, Mr. Peabody tries to be adopted. When a child decides not to take him, Peabody pleas, basically, “adopt me. I’ll do whatever you want.” He still isn’t adopted. 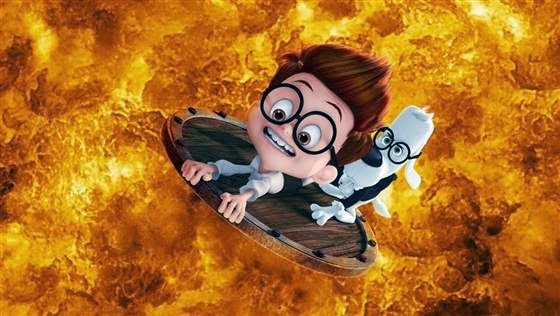 Some of the scenes are similar to scenes in Meet the Robinsons. Peabody struggles with verbally expressing his affection for Sherman. he does not let Sherman call him “dad,” and returns Sherman’s “I love you” with something like, “I have a strong regard for you as well.” Peabody also struggles with letting Sherman grow into some independence (see Pacific Rim). Sherman gets blamed and nearly suffers significant consequences for bullying started by Penny, centered around Sherman’s identity as a cross-cultural (well, cross-species) adoptee. Penny never actually apologizes, but does eventually express her solidarity with Sherman and Peabody. Sherman relates being a dog to the positive behavioral aspects he sees in Mr. Peabody. It’s good for kids adopted cross culturally to find common ground with their parents, but this oversimplification does miss certain elements of what it means to be a dog. It works for a kids’ movie about cross-cultural adoption, but might need to be unpacked some more after the movie. There seems to be a bit of blame allowed to be on kids. When Peabody is not adopted, it’s because he is sarcastic. Later, Sherman says that Mr. Peabody’s only mistake was adopting him. Neither statement is corrected. The social worker in the film, Ms. Grunion, is awful. She is cruel, quick-tempered, vindictive, and prejudiced. The plot is largely driven by her desire to take Sherman from Mr. Peabody, permanently. The situation is never resolved - it just kind of goes away. Sherman was found, abandoned in a box. There is no exploration of his back history. Sherman briefly believes he has seen his father decapitated by a guillotine. At one point, Peabody tells Sherman, “You’re not a dog. Just a very bad boy.” He never corrects this. My recommendation is mixed on this one. It’s an entertaining film, Peabody is a good dad, and he and Sherman do grow closer. They seem to have a good father-son relationship. At the same time, there appears to be lots of potential trigger material (the plot of the movie is – partially - that a social worker wants to end the father-son relationship.) You might want to see it yourself, first, to see whether you think it's a good fit for your own kids. Then be prepared to talk about it with your kids right after the film, if you do choose to bring them. So… Is Sherman a dog? How can you help your kids prepare for and respond to mean things that other kids might say? What makes someone a good parent? A good son/daughter? Thank you so much for this, and other reviews! Can't get this perspective from anywhere else, and it is very valuable. For what it's worth, this movie was incredibly triggering for my (then five or six year old) Little Guy. To be honest, this was the movie that taught me the importance of previewing EVERY movie before letting him watch it, regardless of the movie's rating or the DVD cover. We had a couple weeks of emotional upset and anxiety after viewing the film. I think this movie might be especially triggering for kids in a transracial adoption or foster care situations. Some of the comments the social worker made, about how Mr. Peabody is unfit to parent Sherman, were echoes of things he's heard about our relationship... Kids and adults who've told him that we can never be a real family because he's black and we're white. Or that white people can't really love kids who are black. So this movie was gut-wrenching and scary, in part because he related so strongly to Sherman. A few months after watching the movie, we had our bi-annual meeting with his social worker. He'd always had a good relationship with her. This time, however, we was incredibly anxious and clingy in the days leading up to her visit, and refused to talk to her when she came over. Thankfully, she's a wonderful, competent social worker and his fear of her had dissipated by her next visit. Thank you so much for creating this website. It's a wonderful resource and I'm sure I'll be back here many times. Thanks so much for taking the time to share your kiddo's experience. Movies really can catch kids - and parents - off guard with the way that they approach adoption. I'm glad that your kiddo has a sensitive and thoughtful parent to help him process those times when movies brush unexpectedly up against adoption issues. Thanks again for taking the time to write such a insightful comment!